Dutch solar energy growth – more pyranometers! From single instruments to complete weather stations, warning, process control and measurement systems. The company also provides related calibration and repair services in their own workshop. Bakker & Co. has implemented these solutions in meteorology and a broad variety of industrial applications; such as petro-chemical plants, marine installations, crane operations and renewable energy (solar, wind and biogas). Since 2010 Bakker & Co. has been the Kipp & Zonen distributor for the Netherlands. The photovoltaic (PV) market is currently showing a rapid growth in the Netherlands. This is partly caused by the change in mindset of private house owners, who are beginning to put PV panels on their rooftops. But, the major part is initiated by new utility-scale PV parks supported by the Dutch government with funding. With the SDE+ (Stimulering Duurzame Energieproductie) operating grant for Encouraging Sustainable Energy Production, subsidies for newly installed PV parks are guaranteed a commercial electricity feed-in price for up to 15 years. These subsidies have been initiated to aim towards an energy transition where the country will be much less reliable on conventional energy sources. For the Netherlands this must result in a decrease of CO2 emissions by 43% in 2030 and at least 80% by 2050, compared to 1990. This can only be achieved when the installed base of solar energy parks increases. Not only the number of PV parks is increasing, there is also a clear trend that the projects are getting larger in yield. 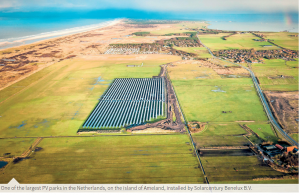 A few years ago 6 MW was the largest installed solar park in the Netherlands. Today the largest park is 30 MW and plans are being developed for solar parks of 50 to 100 MW for the coming years. Consequently, the need for reliable data to correlate the yield to the incoming solar radiation increases. Kipp & Zonen pyranometers are perfectly suited for this. 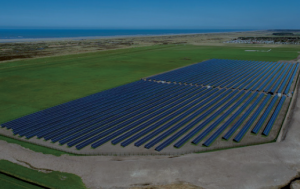 For such large PV projects a reliabel financial partner is an important stakeholder. They will only invest based on a reasonably achievable return on investment. These parties often ask for an independent reference measurement to correlate the yield of the PV panels to the local solar radiation energy received.